Time to join Sherlock Holmes, Evie, and the steam barons again! This series is definitely turning out to be worth the waiting, which favorably is not long for each publishing. AND, the digital prices are great at $5.99 per book with the paperback running on sale for $4.79 right now!!!! AND, Ms Holloway has even given us a few novella introduction pieces for free on Scribd to get us even more wrapped up in Evelina's world of romance and magic and dead bodies (delightful)! Stellar follow up novel. Sophomore novels often suffer in my opinion from the introduction to the working world of the publishing industry (even with the self published). The idea has been born and the plot decided, but now your publisher asks you for three novels to get to the culmination of your story. As any great Sherlock novel should be, Ms Holloway's novels are in serial format. Each story builds off the ones that came before them, but do not rely on reading the previous to understand the present. Maybe that has helped the flow. They are all certainly beautifully interconnected, but the second doesn't stumble all over itself in unladylike fashion trying to catch the reader up on the past. Ms Holloway comes back to Baker Street with a bang this time (quite literally!). Just as Evie thinks she has finally found that solution to the pesky problem of fitting into just one half of her two worlds, she gets blown into a whirlwind of embarrassment and blackmail. Very Victorian of her to do. I was very happy to see an increased presence/dynamic of Imogen and Nick. Childhood romances hold much more sway over me seeing as I married mine after a very Nick-Evie tango. Tobias is a great rogue and makes a stellar argument for brothers' of best friends everywhere, but I am certainly voting for Nick. The villains are as dastardly as ever with new layers of despicable. The steampunk development with the nature of souls is just beautiful writing and painfully felt by the reader. Serafina is a marvelous, thought-provoking creation. Then you have the not-so-villainous bastards. I really enjoyed the addition of the East End crew. The interactions and balance of class structure in these books really makes them, in my opinion. 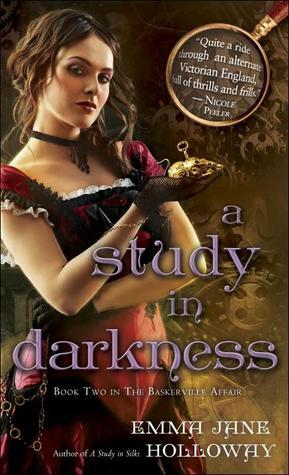 I highly recommend this book to any who enjoys steampunk wit. It comes out next week and you should really consider ordering now. Here is waiting a month for the "conclusion"!